Premium quality flowers. Unforgettable arrangements. At Late Bloomer’s Floral & Gift, LLC, you’re guaranteed to impress. Our friendly experts have everything you need to create the most artful arrangements with the freshest cut flowers. Does your special someone need a little something extra? Peruse our selection of charming gifts. It’s all right here at Late Bloomer’s Floral & Gift, LLC. The convenience of online ordering with a satisfaction guarantee. Take advantage of our 24/7 online ordering for arrangement requests made easy and fast! 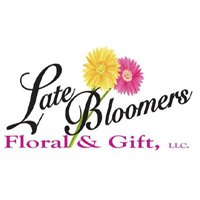 Whether it’s two o’clock in the afternoon or two o’clock in the morning, you can always place your order with Late Bloomers Floral & Gifts, LLC. Need it done right? We stand behind our work with a 100% satisfaction guarantee. Go with a safe bet with us today!